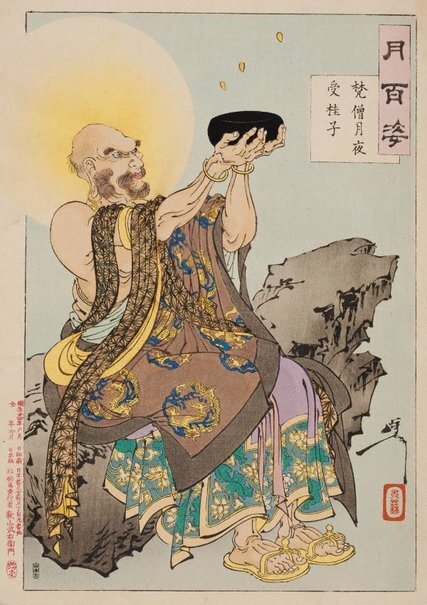 This figure of an 'arhat' ('luohan' in Chinese; 'rakan' in Japanese), a Buddhist who has achieved enlightenment, is catching cassia seeds in his begging bowl as they fall from the moon, which, if eaten, provide immortality. The story of the magical cassia ('katsura') trees on the moon are from Chinese and Japanese legend (see 258.2012.26 'Cassia-tree moon'). This 'arhat' has a brilliant moon as his halo, long ears that signify his wisdom, and numerous characteristics that imply cross-cultural inspirations, such as his Chinese robe decorated with dragon medallions and lotus flowers, and his Indian sandals. He has features that may make him Indian, for example his beard, and this is perhaps an allusion to Daruma (Bodhidharma), who travelled from India to China to teach Buddhism.